This is a chance to explore the hidden gems of Morocco’s ancient camel caravan route as you journey from Marrakech, through the High Atlas and to the Erg Chigaga dunes in the Sahara Desert. On this 8-day Marrakech and Sahara itinerary you’ll experience incredible scenery, unique adventures, delicious Moroccan cuisine, and luxurious accommodations. With a private luxury Sahara tour, you’ll be able to explore sights often missed on organized group tours. Today you’ll arrive at Marrakech Menara Airport, where you’ll discover the Red City from the comfort of a traditional riad inside the Medina and within walking distance to all of Marrakech’s attractions. For ideas of things to do in Marrakech, check out our friend Maroc Mama’s ultimate guide to Marrakech. Take to the streets exploring the Medina and getting a feel for Marrakech. Graze on street food in the Medina like fresh fruit juice, sfenj (Moroccan donuts) and eggplant fritters. Try your hand at haggling for leather goods, spices and other souvenirs. 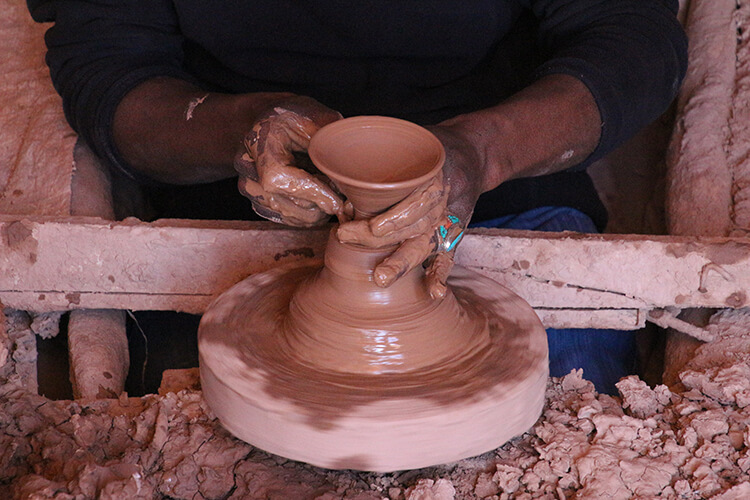 Hold off on purchasing any pottery because you’ll visit a village famous for its traditional pottery on the way to the Sahara. Book a reservation for Yannick Alléno’s acclaimed La Grand Table Française at The Royal Mansour. Splurge on the chef’s tasting menu with wine pairings. 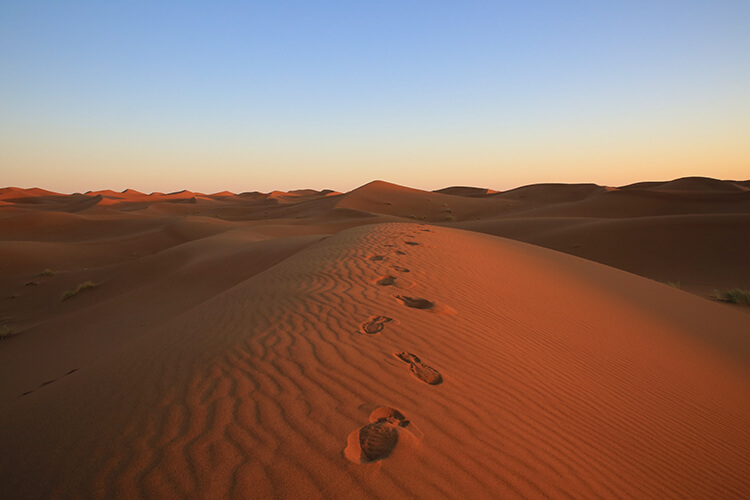 Today you begin the long journey to the Sahara on a private tour with Amazing Journeys Morocco. The drive in a 4×4 vehicle takes you up and over the High Atlas Mountains. If you’re lucky, there will be snow and you can stop for a snowball fight. 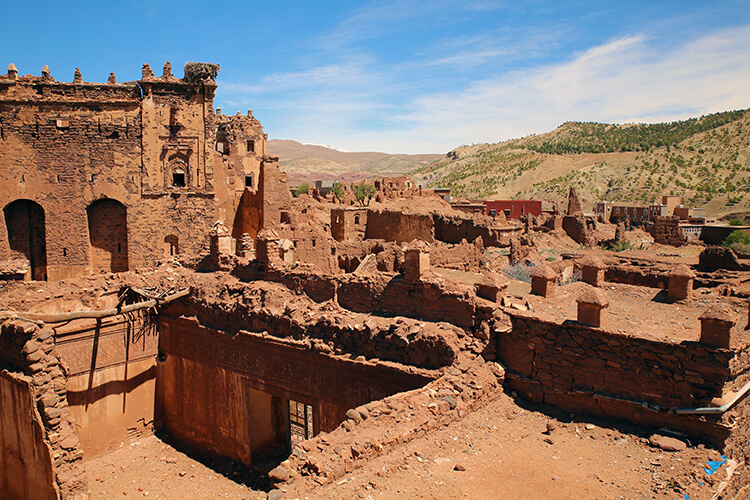 You’ll have time to visit Telouet, a now crumbling Kasbah that was the seat of power of the infamous El Glaoui. El Glaoui was once one of the richest men in the world, but he was exiled after he was found to be a traitor for siding with the French occupation of Morocco. This is a special sight as many tourists to Morocco never see it since it’s hard to reach and organized tours don’t go there. You’ll also have time to visit the UNESCO World Heritage Site of Ait Ben Haddou. A long list of movies have been shot at the ancient city including blockbusters like Gladiator and The Mummy and the tv series Game of Thrones. Climb up the sloping cobbled streets to the ruined agadir for a spectacular view over the area. End the long day in Skoura with a traditional Berber dinner served family style and do a bit of stargazing before heading to bed at a comfortable guest house. Today is a long day of driving through the beautiful Draa Valley past palmeries and mud-brick Berber villages just begging to be photographed. Begin the day with a Berber breakfast at Dar Panorama. Make a stop in the Draa Valley, known as the date basket of Morocco, to purchase a box or two of the delicious dates. You’ll also briefly stop in Zagora, where a selfie with the famous 52 days to Timbuktu sign is a must. You’ll have time to visit with the potters who make the famous green glazed Tamegroute pottery. See how the pottery is made from start to finish and have time to shop in the village’s pottery shops. If it’s open, you can also visit the Quranic Library which was once one of the richest in North Africa. It once held a collection of over 40,000 ancient books and rare manuscripts, and today 4200 are on display. Have a traditional Berber lunch with a family in their remote home. You’ll also have one last opportunity to visit a little market to pick up any drinks and snacks you might want while staying in the Sahara. After the village, you’ll off-road through the Sahara making your way to the ATTA Desert Camp in the Erg Chigaga dunes. You’ll stop at the Oasis Sacrée, where nomads bring their herds to cool off. Reach ATTA Desert Camp in time to climb the dunes or ride a camel for your first sunset in the Sahara. Spend the night in luxury nomad tents and gaze in awe at more stars than you’ve ever seen. If you’re visiting at the right time, the Milky Way is even visible. There’s quite a lot to do in the Sahara! Wake up for sunrise over the dunes. In the cool morning, you might be able to spot some of the Sahara’s wildlife like the jerboa, oryx or dama gazelle. Visit with the Nomad School, where you can interact with Berber children from a nearby nomad family and see what they are learning. At lunchtime, the children might invite you home with them for some tea. You can also do some dune bashing for an adrenaline pumping adventure in the desert. Help make sand bread back at the camp and test out your balance skills sand boarding down the dunes. Today is a long day as you make your way all the way back to Marrakech. After enjoying breakfast at the camp, you’ll off-road to Lac Iriki. The dry ocean bed of Lac Iriki is the perfect place to have some fun with perspective like balancing on a bottle or holding your 4×4 in the palm of your hand. Come prepared with props! 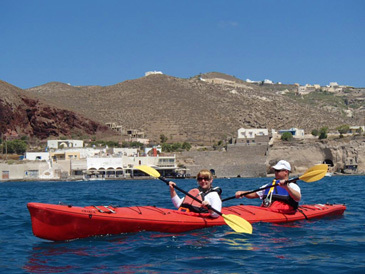 You can also look for fossils on the surrounding cliffs and visit another desert oasis. Once you leave the Sahara behind, make a stop in Tazenakht. This village is famous for its Berber carpets and you can haggle for beautiful woven rugs to bring home. Feel like you’ve been transported from Morocco to the all-American Route 66 with a quick stop for photos at the now abandoned set of The Hills Have Eyes. When the horror movie finished filming, they left the 1950s style gas station they built behind. Arrive in Marrakech late in the evening and relax with some room service after the long trip. Can’t you picture yourself here? The trip to the Sahara and back is a long, exhausting one. Savor sleeping in, enjoying a leisurely breakfast and relaxing poolside – whether that be at the Mandarin Oriental’s pool garden or in your private pool villa. Scrub away the sand and dry skin from the desert at the MO Spa with a traditional hammam experience. Grab some of the MO’s bicycles and enjoy the lush grounds with 100,000 roses. Finish off the evening with a dinner at Mes’lalla. 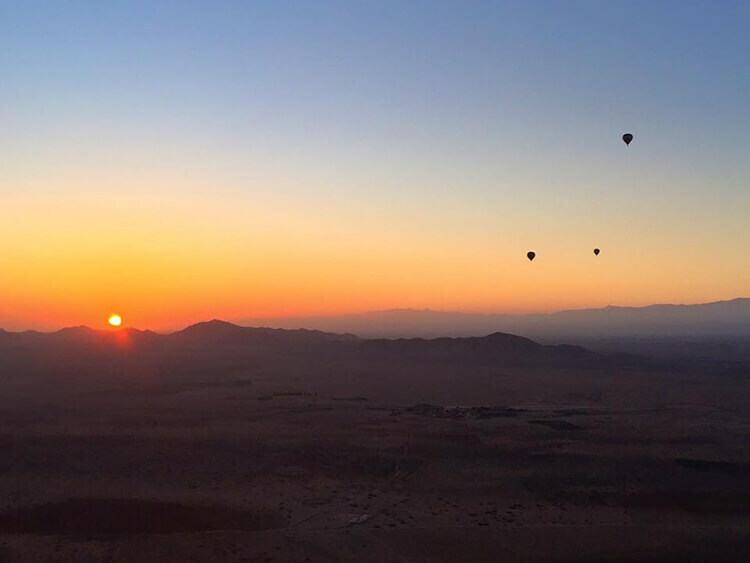 Start off the day with a very early morning wake-up for hot air ballooning over Marrakech. Get a birds-eye view of the Medina and the High Atlas Mountains as you silently drift over the Red City. The hot air balloon experience ends with a short camel ride at the Palmerie. 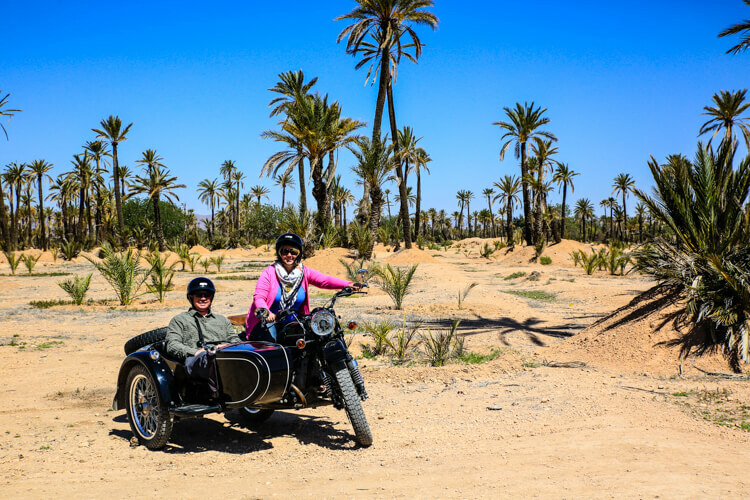 Next, explore Marrakech with Insiders Experience in a sidecar motorcycle. A local will show you all the spots not often visited by tourists like the old Jewish ghetto, the best street food spots and more as you weave in and out of tiny alleys and bougainvillea covered streets. 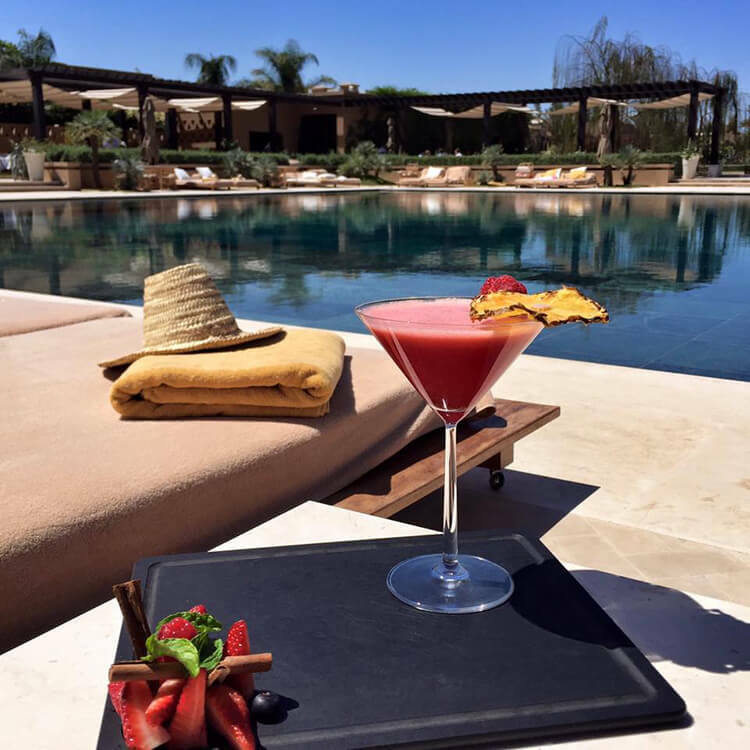 Some relaxation back at your pool villa is in order before an evening progressive dinner in some of Marrakech’s most beautiful riads on a gourmet food tour with Marrakech Food Tours. Spend your last few hours in Morocco at El Badi Palace, a ruined palace often overlooked by tourists in favor for the nearby Bahia Palace. Here you’ll find more storks than people as you roam around the ruins. Pick up any last spices or souvenirs in the Medina or relax on a roof terrace taking in the rooftops of the Red City one last time before heading to the airport. This article contains affiliate links. When you book on Booking.com or Viator through our affiliate sites, we earn a small commission at no additional cost to you. Wow, this truly is the perfect itinerary for Marrakech and exploring the Sahara. This is one of the places where we want to explore the local and authentic dishes. Pinning this post for 2017. Great recommendations on activities and where to say!! Well done. You definitely have to do a Marrakech Food Tour the, Rosemary! Amanda has amazing recommendations for finding local, authentic dishes. Glad to hear you found it helpful, Eileen! I can definitely picture myself enjoying a cocktail at the Mandarin Oriental Marrakech. Actually, the entire itinerary looks awesome. The MO Marrakech was truly fab! I’ve been to quite a few Mandarin Oriental properties around the world and Marrakech was by far my favorite. Such a contrast between the decadence of the resorts, to the desolate deserts. Marrakech looks beyond amazing. It really was! We can’t wait to go back and explore more of Morocco. Wow, I love this. Great photos-as a potter, I especially love the potter info and photos! SO cool. I need to put Morocco on my travel bucket list now. 🙂 Thanks for the inspiration! I was seriously impressed how quickly the potter could make things. He was a very skilled craftsman! And fascinating how they create the colors. You’d love all the Moroccan pottery. Amazing place. Those old ruins look incredible, so much history. I didn’t know much about Morocco’s history before we visited. 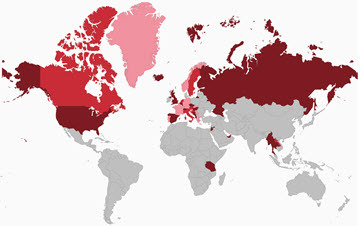 Fascinating country! Love the write up on Marrakech, usually when I read blogs on Morocco more people tend to cover Casablanca and Tangiers hence it is good to read on a detailed write up on Marrakech! Thanks, Prateek! We wish we’d had even more time in Marrakech. I think a lot of people skip it or feel overwhelmed by the busyness of Marrakech, but it really shouldn’t be missed. You guys capture good images. Anyway Marrakesh I like very much. I have visited this city many times. what you like most in this city. Nice Post. Thanks for sharing wonderful content.Marrakesh is the first experience destination not to miss during their holidays to Morocco. I would love to do a shortened version your Sahara trip. I am only in Morroco for 6 days and am scheduled for the first 2 days inn Marrakech. Is it possible to do a “mini” Sahara? If so could you give me an idea of the cost. I am leaving to do Volunteer work in Ghana February 6th. I will be there 3 week then going to Morroco. I am trying to set up the sahara trip before I leave it since I may not be near wifi too much. Let us know if you have any other questions we can help with!